If there’s a bottle of Angostura Bitters gathering dust in your larder, take it out and cradle it. Then, immediately hide it again. There has been a rash of worldwide burglaries perpetrated by desperate bartenders as supplies of the concoction dry up. OK, that’s not entirely accurate. But if the stuff doesn’t start shipping again soon, well: just don’t say I didn’t warn you. There’s an Angostura drought, and no one seems to really know why. Reports about The Great Angostura Crisis of 2010 have appeared in publications from The Guardian to the Washington Post. It seems that the House of Angostura had some sort of dispute with the company that supplies its bottles. Just what stopped the bitter flow is uncertain. It’s a mystery. Just like the recipe itself. The exact Angostura formula is reputedly known by only eleven people. It’s made of gentian root, alcohol and goodness’ knows what else. The heady secret has been protected since 1824, when it was developed by Dr. Johann Gottlieb Benjamin Siegert, a doctor in Simon Bolivar’s army in Venezuela. The drink may not have played as key a role as Bolivar in Latin America’s liberation from Spain. But it did have a pivotal impact on cocktail creation. This is the stuff that levels a Pisco Sour, gives a Mai Tai its complexity and makes a Manhattan cocktail sting. Today, the oversized label on the bottle is packed with information on a variety of applications, from adding zest to soups and salads to plum puddings and stewed prunes. The most civic-minded use for the drink is, of course, in Lemon, Lime and Bitters. The designated driver would be lost without this grown-up soft-cocktail. For, even though Angostura has a 44% concentration of alcohol, it is always used as a condiment and never as a solo drink. The magic, mysterious liquid still holds the Royal Warrant of Appointment to Queen Elizabeth II. For the moment, however, it is bartenders who are tackling the crisis head on. Happily, there is help at hand. To tide us over, or, perhaps, to convert us, a new line of bitters from Germany have landed in Australia. The Bitter Truth line features Old Time Aromatic Bitters, which are the closest match for the Angostura drink. 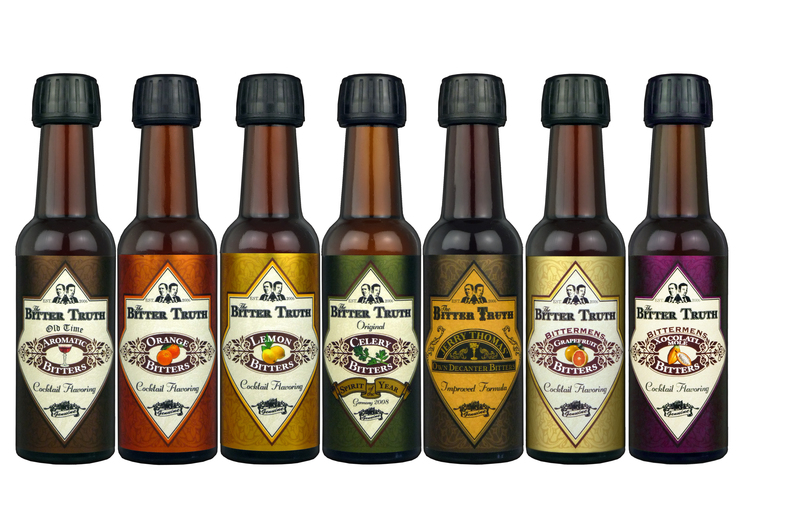 Launched in 2006 by Munich bartenders Stephan Berg and Alexander Hauck, the range also includes bitters enhanced by lemon, orange, grapefruit, celery and the truly exotic Bitterman’s Xocolatl Mole. The varieties available will bring a new kick to old favourites. They may well inspire a new generation of pungent, peculiar cocktails. That’s the wonderful thing about cocktails, of course. They can help you see a silver lining in even the darkest cloud. But, when the mists of alcohol clear, the sad fact remains: Trinidad’s most famous export is currently on hold. I’ll report back when the shortage is resolved. In the meantime, I think we should all keep an eye on Buckingham Palace. IF ER’s supplies run out, there might be a constitutional crisis.